It's a magical place, sheltered by towering trees and soothed by a tiny bubbling spring that murmurs duets with the breeze. Just a stone’s throw from the road, it’s still easy to miss unless you know what you’re looking for. I stood there first more than a half-century past. My father, who loved Stanley Park in Vancouver, brought me to visit Takehionwake’s resting place, because I loved her poetry. Indeed, from my earliest memories I had been fascinated by this beautiful poetess—part Mohawk, part English, all Canadian. The youngest of four, Pauline’s First-Nation name meant double life, a description that fit in many ways. Her parents were a Mohawk chief of mixed ancestry and an English immigrant. Although her parents’ marriage had been opposed by both families, out of mixed-race concerns, the Johnsons were soon acknowledged as a leading Canadian family, enjoying a high standard of living. The family home, Chiefswood, on the Six Nations Indian Reserve outside Brantford, Ontario, became well known and was visited by intellectual and political guests. Now, once again, I was back at that magical place, kindness of my cousin Tim. The grandson of my father’s brother, it seemed somehow fitting that someone in my father’s line was helping me reprise my original journey. 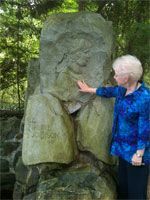 Standing beside the granite boulder, into which is carved a likeness of Pauline Johnson’s profile, bits of poetry came flooding back. Much of her writings spoke to my brain and heart in some way or another, but perhaps “The Song My Paddle Sings” most of all. Metaphorically it spoke of her own life, as she took responsibility for her poetry and fifteen years of public presentations, breaking the mold of the typical woman of that era. Metaphorically it forecast some of mine. The realization that when the wind chose to blow—well and good, but it was somewhat capricious and could not be depended upon for sustenance and direction. For that, it was your own paddle, requiring the necessity of consistent effort in cooperation with the environment, and bringing the thrill of creativity, accomplishment, and reward. And next, probably “Finale,” with its gentle and compassionate allusions to connection with nature, music, and friends. Johnson’s writing extended beyond that of poetry, however. Her book of stories about the Squamish people of North Vancouver, Legends of Vancouver, is still considered a classic of Vancouver literature. With my family, I had moved half a dozen times or more by the time my sixteenth birthday arrived. As we packed and unpacked every few years, collecting and discarding, the one book with which I took exceeding care was Flint and Feather, a collection of selected Johnson poems. I gazed at the granite monument once more, so congruent with its surroundings, so peaceful and yet so alive, so connected with the past and the present. My father had gone out of his way to give me an experience that had lodged itself in the deepest corner of my heart, the memories wrapped in part by his caring and in part by Pauline’s words. Just the year before my father was born, Pauline Johnson died in Vancouver, British Columbia—of breast cancer. Her funeral, the largest to date in Vancouver, was held on her 52nd birthday. By 1921 a granite monument to her memory had been created in Stanley Park, beneath the murmur of the cedar trees, beside the bubbling of a tiny spring, amid the solitude of star-reflected light, beside the sea. The inscription on her granite monument reads in part: In memory of one who’s life and writings were an uplift and a blessing to our nation. Ah, yes, as they have been in my life; as they have been to me. Dusk of the forest creeps. Of day is darkening. Good-night. Good-night. Shall voice my answering. Good-night. Good-night. O! Wind of the west we wait for you. O! drowsy wind of the drowsy west. Be strong, O paddle! Be grave, canoe!